Botswana's new Minister of Investment, Trade and Industry, Bogolo Kenewendo. Bogolo Kenewendo is being celebrated on social media for being the youngest minister ever in Botswana's parliament. 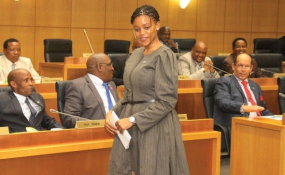 Kenewendo first joined parliament in 2016 as an elected MP by former president Ian Khama, and she is now the Minister of Investment, Trade and Industry. Her appointment has received a lot of praise as most political positions are given to older people. The 31-year-old was born in Motopi village in the Boteti area in Botswana. She holds a BA Degree in Economics from the University of Botswana and an MSc in International Economics from the University of Sussex in the United Kingdom which she obtained after landing a Chevening Scholarship. She has run and taken part in several high-level positions and projects in Botswana including being part of the former president Ian Khama's Private Public Dialogue structure, the High-Level Consultative Council which is a structure aimed at addressing the challenges of the private sector in Botswana. In September 2009 Kenewendo was one of two Botswana youth delegates at the 64th Session of the United Nations General Assembly and was nominated to present a statement of African youth to the Secretary-General of the United Nations. She has also taken part in a number of prestigious programmes including the Foreign and Commonwealth Office International Leaders Programme in 2016, A variation of the US President Obama's YALI for Young Women Leaders in 2011. After taking part in the young African women leaders' forum which was hosted by Michelle Obama in 2011, she and her friend were inspired to form a mentorship programme called Molaya Kgosi aimed at mentoring and exposing young women to experienced and successful women in this country. Kenewendo has worked as a trade economist in the ministry of trade and industry in Ghana and was previously employed as an economic consultant at Econsult Botswana. Her areas of expertise include Macroeconomic policy, public debt management, trade policy, export development, trade in services, regulatory frameworks, trade-related issues, trade and investment policy, industrial development policy, institutional frameworks for policy formulation, poverty alleviation, financial sector development. In 2012 Kenewendo was honoured with the Ten Outstanding Young Persons award by Junior Chamber International Botswana. One of her biggest role models is her mother who she describes as resilient after suffering several strokes, surviving losing a child in front of her eyes and was never afraid to explore opportunities when given a chance. In her spare time, she meditates, travels and read.